ABOVE: A U-Bahn train enters the Marienplatz station. The U-Bahn, which is an underground or subway system for the city of Munich, with stations at or near such attractions as the Schwabing district, the major parks, the BMW Museum, the Allianz Arena, and the Oktoberfest grounds. The S-Bahn, which serves both Munich and its suburbs. S-Bahn trains run between the city's two central railroad stations (the Hauptbahnhof and the Ostbahnhof), serve outlying places of interest such as the Dachau Concentration Camp Memorial, and provide frequent transportation between the city and Munich International Airport. The two systems are tightly integrated and use a common ticketing scheme. The most obvious difference between the two is the color of the trains: U-Bahn trains are blue and white; S-Bahn trains are red and white. 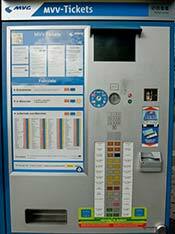 You can purchase tickets from a vending machine in any U-Bahn or S-Bahn station. Single-Tageskarten and Partner-Tageskarten, or single and partner day tickets, allow unlimited transportation from the time they're stamped until 6 a.m. the next day. You can buy them for individuals or for a group of up to five people. Finally, the CityTour Card comes in one-day and three-day versions, for either the city proper or the entire Munich area. 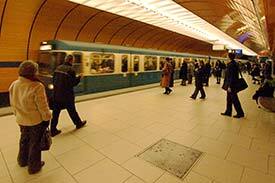 In addition to unlimited public transportation, it entitles you to discounts at many museums and other attractions. 2 Validate your ticket or City Tour Card. 3 Take the stairs, escalator, or elevator to the train platform. You won't need to insert your ticket in a turnstile; once you've validated your ticket, you're on the honor system (although you'll have to show your ticket to an inspector if asked). 4 Check the electronic sign. Signs above the platform indicate train numbers, destinations, and where to stand on the platform for the train (look for the overhead sector signs labeled A, B, C, and D). 5 Board the train when it arrives. If necessary, press the button on the doors to open them, and let other passengers get off before you get on. 6 Exit the train on the left or right, depending on where the station platform is. In a few central locations, such as the Hauptbahnhof, there are two platforms: you leave via the right-hand doors, and new passengers board through the doors on the left. For more information about Munich's U-Bahn, S-Bahn, trams, and buses, pick up a multilingual Hin und Weg in München brochure at the tourist office or visit the MVV (Munich public transportation) Web site. S-Bahn train photo copyright © Tan Wei Ming.